Cogent is a leading Indian Contact Center. Cogent serves more than 20 million customer touch points a month in India & Bangladesh, in a multi-channel and multi-language environment. Cogent’s clientele includes top Telecom, Media Broadcasting, Retail and Consumer Durable companies of the subcontinent. Cogent installed Solicall’s noise firewall solution with its advanced noise reduction technology for call centers in order to improve call quality and specifically to remove the ambient noise coming from the call centers. The main source of ambient noise that PBXMate was configured to remove is voices of nearby agents and the shouting of the team-leaders. This significant improvement in audio quality is not a one-time incident. 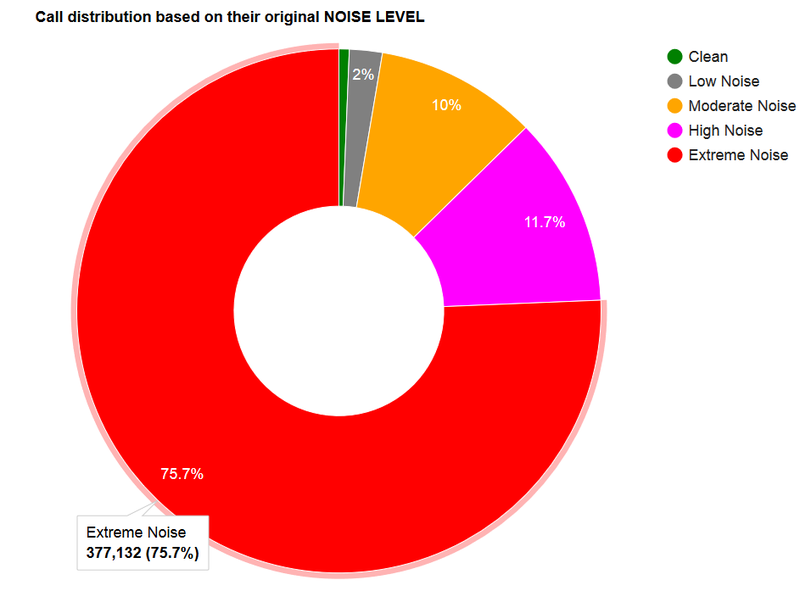 When looking at long-run statistics we see that in ~75% of the calls PBXMate is removing extreme noise from the audio as can be seen in the below pie chart.